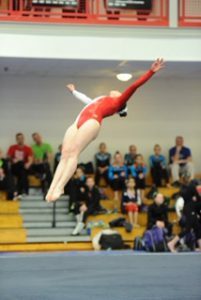 Here at Tumble Time, our girls USAG competitive program allows our competitive athletes to challenge themselves at various levels of compulsory and optional routines from levels 2-10. Level 3 is revamped this year. The athletes that are on this team practice between 6 and 9 hours a week. 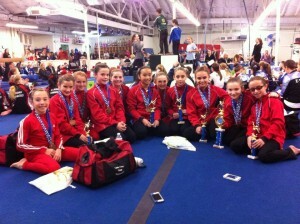 This year, Level 3 will be competing at Get Your Feet Wet meets as well as USAG meets. They will compete 5-7 times throughout the season. Some of the skills that the girls will be working on are: round-off back handspring on floor, vertical handstand on beam, front hip circles on bars, and hand stand flat backs on vault. This team is coached by Mallory Lavallee. In this class, students hone their fundamental body positions for the sport, and the basic skills of a competitive gymnast on each apparatus. Students learn the USAG Compulsory routines, and work on mastering the appropriate skills for that level, and the next. This team competes 4-8 times per year. Our compulsory levels 4 & 5 train year round with a minimum of 8 hours per week. Our optional levels 6-10 also train year round and train up to 20 hours per week. The athletes training consist of learning skills and performing them in routines on all four Olympic events (Uneven Bars, Floor Exercise, Vault and Balance Beam). In addition to learning skills and performing routines, our gymnasts also spend time on strength training, flexibility, conditioning and core strengthening. Our competitive season runs approximately from November-May. This program is an achievement based system. 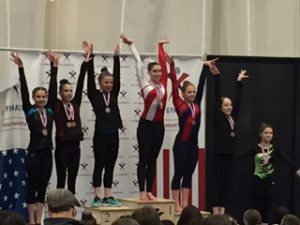 As the athlete achieves a predetermined All-Around score, they are then able to compete at more challenging competitions such as Sectionals, State and Regional Championships, and able to move on to the next level. The All-Around score is set by USA Gymnastics who is our national governing body which we follow.